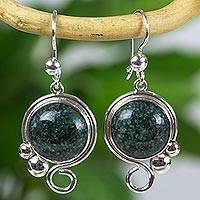 Natural jade in forest green tonalities nestles in a halo of silver. Zandra Lorena Sajbin selects asymmetrical Guatemalan gems to craft earrings of classic beauty. 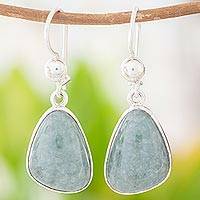 Crafted by hand, these earrings recall leaves that sigh in the forest breeze. Alon Diller adds beautiful brushed textures to silver mined in Taxco. Superbly crafted of sterling silver, this design evokes the lush Thai rainforest. Aoy presents earrings shaped like lacy teardrops. Sarote Lochotinunt invokes the forest with this handsome design. Dancing on sterling wires, silver cylinders reveal cutout shapes depicting leaf shadows. Forest motifs cover elegant chandeliers of sterling silver. 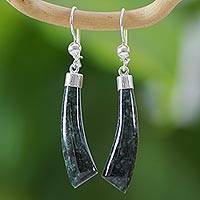 From Bhavesh in India, these earrings in dark oxidized silver dance on high-polish hooks. Sterling silver is used to create elegant openwork, resembling a wall of flowers and vines that dangle from the ears. India's Rajeshwar presents this marvelous pair of dangle earrings. Taking her inspiration from nature, Jantana creates delightfully modern earrings. Their spiraling stems are cut by hand from sheets of silver and given a brushed texture. Crafted by hand, these exquisite earrings come from Jose Antonio Ibeibarriaga. Leaves from a magical forest whisper of autumn secrets. Superbly crafted of sterling silver, this design evokes the lush Thai rainforest. Aoy presents earrings shaped like gleaming leaves.